Images, Videos, Animations of collaboration, events & plots, outreach, milestones, detector & technology, and the best of. The ATLAS detector is one of the largest and most complex scientific instruments ever constructed. 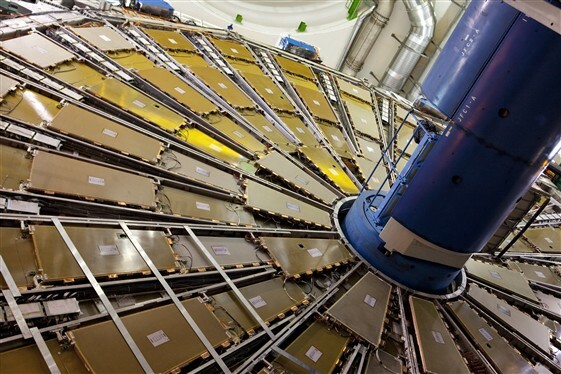 It is located at Interaction Point 1 of the Large Hadron Collider (LHC) at CERN. The various, specialised components of the ATLAS detector were constructed at institutes located around the world, then shipped to CERN, tested and integrated with other components, lowered 93 metres below ground into the cavern, then finally assembled into the complete detector. When the LHC is operating, scientists take shifts around the clock in a control room on the surface to run, calibrate, and monitor the detector components, and to control the flow of data to the Tier 0 computing farm across the street at CERN. This collection of multimedia material features the construction, testing, installation, and servicing of the major components of the detector, including the Inner Detector, Calorimeters, Muon Spectrometer, Magnets, and the Trigger & Data Acquisition, as well as the Site at Point 1. See the full Detector & Site Collection on the CERN Document Server. Read more about the ATLAS Detector on the Discover ATLAS pages. Take a virtual tour around the ATLAS detector in the cavern. Walk around the detector and control room using Google's street view.